Below is a historical accounting for Troop 746's visits to Philmont. This accounting of the Troop's visits to Philmont started as a project for our Troop Historian. Currently Troop 746 sends a crew (or two) on a high adventure trek every 3 years. Most years Philmont is selected as the destination by the youth. In 2015 had our only Philmont staff from T746 Youth. Though I believe Mr. Chuck Chamberlain one of the current Asst. Scoutmasters served as staff in his youth scouting. The 75th Anniversary for Philmont so another special patch. Another special year, BSA 100th Anniversary, and another special patch. 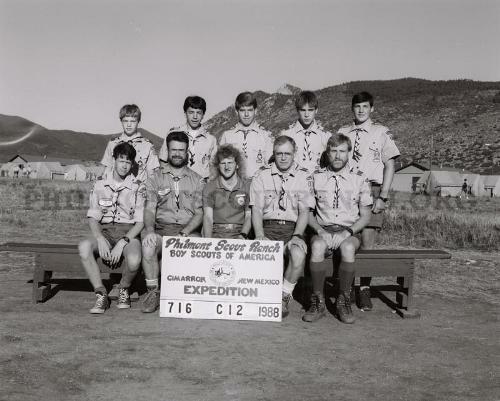 One T746 youth decided to go in an off year as 1988 was the 50th Anniversary for Philmont. A special patch was issued. This crew included Erik Leppo as a youth who would become Scoutmaster for T746 in 2015. I believe Chris Burton went. Possibly 1978 and 40 years.